Brutus is made from a fuzzy black material with a brown muzzle, legs and eyebrows. 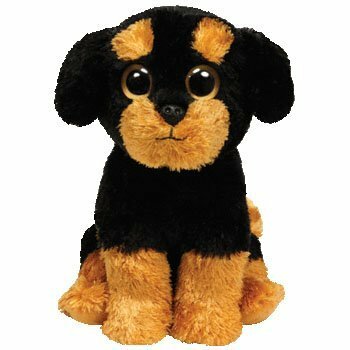 He has large gold and black button eyes and a black nose with black stitching for his mouth. Just look at me…aren’t I too cute?! Brutus was introduced in July 2014. His birthday is on 26th March 2014. Brutus is a Rottweiler dog. This is the 2014 version of Brutus. There was a 2006 version with the same style number that was in a standing position. There are three other variations of Brutus with the style number 40803 that look very similar.